Formula X is Sephora’s new innovative line of lacquers that is dubbed the best in performance and play. This 3-free lacquer collection has more than 200 shades which include different colors and effects. Read more to see what colors I used to create this Holo-tartan print that is perfect for the Holidays yet you can get away with wearing all year! The colors I used to create this look was Desire, JuJu, Need For Speed and Dark Matter from Sephora’s Formula X line. The white-capped lacquers are from The New Classics collection. I am so impressed by the rich color of “Desire” which is a brilliant bright blue. “The lacquer from the New Classics is infused with a luminescent ingredient to enhance sheen and overall shine” reports Sephora. The black caps represent The Effects collection which allows you to get creative in a flash. Effects from Formula X include dimensional glitters, shifting metallics and holographics, safe neons, and top coats that transform any look with many different finishes like color spotting and opalescence. 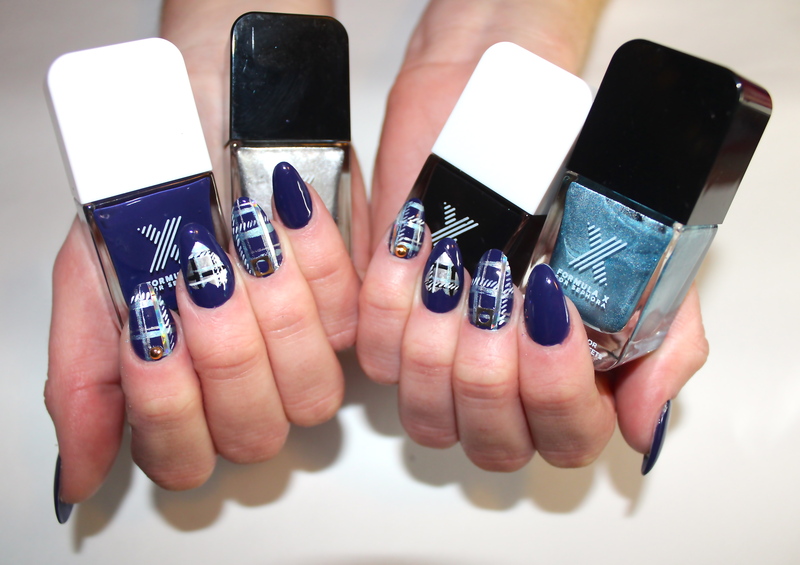 Formula X even introduced 3D nail appliqúes to their collection for the ultimate quicky nail transformation. I love that a nail polish line has been created to cater to nail art and encourage experimentation! Not to mention their promo video is basically a nailgasm! Watch the video below to see what I mean. Nail lacquer addicts, beware! ← Ulta Reaches 1 Million and Celebrates with AstroWifey Nails!